Our Head Boys Gymnastics Team Coach and Boys Program Director, Liz Virnig, was named Coach of the Year by the Wisconsin Coaches Association in 2013. 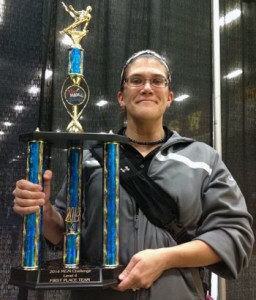 It was a very proud moment for Madtown Twisters, as Liz Virnig made history, being among one of the few women to be nominated for the Men’s Gymnastics Coach of the Year. Of course, this comes to no surprise to us here at Madtown Twisters, as we have seen her, day in and day out, work those boys to their full potential. “Honestly, I think I am still in shock with being awarded this honor.The coaches that were nominated this year are all amazing coaches with great programs or are on the way to becoming great again. I feel honored just to have my name alongside these coaches, but I was chosen by my fellow coaches and judges in the state. This makes me happy, excited, and proud to be the Head Boys Coach at Madtown Twisters. Fall Schedules and Registration now available!